* * * NOTES: Awarded the WWWF title when the WWWF left the NWA. * * * NOTES: This title switch is not recognized by the WWWF. * * * NOTES: Title was held up on October 19, 1981. * * * NOTES: Defeated Greg Valentine in a rematch. * * * NOTES: Click Here for a photo of the pinfall. * * * NOTES: Stripped after trying to sell the title to Ted DiBiase. * * * NOTES: Vacated after controversial finish. * * * NOTES: Ric Flair wins the Royal Rumble to capture the WWF Title. * * * NOTES: This was an Iron Man match ending 1-0. * * * NOTES: Vacated on February 13, 1997. * * * NOTES: Defeated Steve Austin, Undertaker & Vader. * * * NOTES: The infamous Montreal ScrewJob. * * * NOTES: Title Held Up. * * * NOTES: Defeated Mankind in the Finals of a Tournament. * * * NOTES: Defeated Steve Austin & The Rock in a 3-WAY. * * * NOTES: Vacated on September 20, 1999. * * * NOTES: Won a Six-Pack Challenge. * * * NOTES: Substituted for Steve Austin. * * * NOTES: Unified with WCW World Championship. * * * NOTES: Defeated The Undertaker & Kurt Angle. * * * NOTES: WWE Championship became exclusive to SmackDown!. * * * NOTES: Defeated Brock Lesnar & Big Show in a 3-WAY. * * * NOTES: Defeated Kurt Angle in a 60-Minute Iron Man match. * * * NOTES: Defeated Eddie Guerrero in a Bullrope match. * * * NOTES: Edge cashed in his Money In The Bank. * * * NOTES: Defeated RVD & John Cena in a 3-WAY. * * * NOTES: John Cena was stripped due to injury. * * * NOTES: Randy Orton was awarded the title by Vince McMahon. * * * NOTES: Randy Orton defeated Triple H in a Last Man Standing match. * * * NOTES: HHH defeated Randy Orton & John Cena & JBL in a 4-WAY. * * * NOTES: Edge was inserted into an HHH vs. Kozlov match at the last second by Edge's wife and General Manager Vickie Guerrero..
* * * NOTES: Jeff Hardy defeated Edge (c) and Triple H in a 3-WAY after Vladimir Kozlov interfered..
* * * NOTES: Edge defeated Jeff Hardy in a controversial No-DQ match after interference from Chavo and Vickie Guerrero - plus Matt Hardy's shocking turn on his brother..
* * * NOTES: Triple H defeated Edge (c) and Jeff Hardy and the Undertaker and the Big Show and Vlaidmir Kozlov in an Elimination Chamber match to win the WWE Championship!. * * * NOTES: Randy Orton & Cody Rhodes & Ted DiBiase Jr. defeated Triple H & Batista & Shane McMahon in a six man tag team match where Triple H's WWE championship was on the line. * * * NOTES: Batista defeated Randy Orton in a Steel Cage match. The following night on RAW, Randy Orton & Legacy destroyed Batista to the point of injury, so the championship had to be vacated and put up for grabs the following week. * * * NOTES: Randy Orton defeated Triple H and John Cena and the Big Show in a 4-WAY to capture the vacant WWE championship! * * * NOTES: John Cena defeated Randy Orton in a "I Quit" match to win the WWE title! * * * NOTES: Randy Orton defeated John Cena in a Hell in a Cell match to capture the WWE championship! * * * NOTES: John Cena defeated Randy Orton in a "60-Minute Iron Man" match by a score of 6-5 to win the WWE championship! * * * NOTES: Sheamus defeated John Cena in a tables match to win the WWE championship! * * * NOTES: This match was ordered by Vince McMahon immediately following the Elimination Chamber match. Batista won in about 30 seconds! * * * NOTES: Sheamus defeated John Cena (c) and Randy Orton and Edge in a four corners match after interference by the NXT to win the WWE championship! * * * NOTES: Randy Orton defeated Sheamus (c) and John Cena and Chris Jericho and Edge and Wade Barrett in a 'Six Pack Challenge' to win the WWE championship! * * * NOTES: The Miz cashed in his "Money in the Bank" contract on Randy Orton (after Orton had been attacked by the Nexus, and miraculously defeated Wade Barrett in a title match) to win the WWE championship! * * * NOTES: John Cena defeated The Miz (c) and John Morrison in a triple threat steel cage match to win his 10th WWE championship! * * * NOTES: C.M. Punk won the title on the day his contract "expired." He then left the WWE (in storyline) with the belt, so it was vacated and a tournament was announced. * * * NOTES: Rey Mysterio defeated The Miz in the finals of an 8-man tournament to win the vacant WWE championship. * * * NOTES: John Cena defeated Rey Mysterio in the main event to win the WWE championship! After the match, C.M. Punk was brought back with his title, setting up a champion vs. champion match. * * * NOTES: WWE champion C.M. Punk defeated WWE champion John Cena to become the "undisputed champion." After the match, Kevin Nash returned to WWE and attacked C.M. Punk. * * * NOTES: Alberto Del Rio cashed in his "Money in the Bank" contract and won the undisputed championship! * * * NOTES: Alberto Del Rio defeated C.M. Punk and John Cena (c) in a triple threat 'Hell in a Cell' match to win the WWE championship. * * * NOTES: Randy Orton cashed in his "Money in the Bank" briefcase after Triple H (the guest referee in the main event between Daniel Bryan and John Cena) turned on Daniel Bryan and hit him with a pedigree. * * * NOTES: WWE COO Triple H stripped Daniel Bryan of the WWE title because he believed referee Scott Armstrong was guilty of a fast "three-count" at Night of Champions. * * * NOTES: Shawn Michaels was the special guest referee and was directly involved in the finish of the match. He hit Daniel Bryan with Sweet Chin Music to end the match. * * * NOTES: WWE champion Randy Orton defeated WWE world heavyweight champion John Cena in a TLC title unification match. 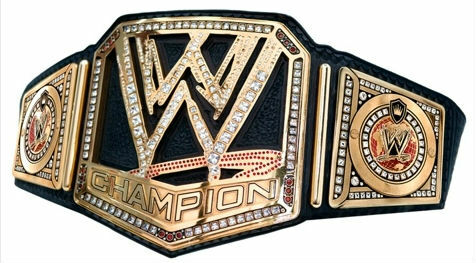 The title was officially renamed the WWE world heavyweight title. * * * NOTES: This was a triple threat match between WWE world heavyweight champion Randy Orton, Batista, and Daniel Bryan. * * * NOTES: WWE COO Triple H and Stephanie McMahon stripped Daniel Bryan of the WWE title because he injured his neck and can't defend his championship. * * * NOTES: John Cena defeated Kane, Randy Orton, Alberto Del Rio, Sheamus, Roman Reigns, Bray Wyatt and Cesaro in a “Money in the Bank” ladder match to win the vacant WWE world heavyweight championship. * * * NOTES: During the main event title match between champion Brock Lesnar and challenger Roman Reigns, Seth Rollins decided to cash in his “Money in the Bank” briefcase, making the match a triple threat contest. He then pinned Roman Reigns to become the WWE world heavyweight champion. * * * NOTES: The title was vacated after Seth Rollins injured his knee at a house show in Dublin, Ireland on November 4, 2015. * * * NOTES: Roman Reigns defeated Dean Ambrose in the finals of a 16-man WWE world heavyweight championship tournament. * * * NOTES: Sheamus cashed in his "Money in the Bank" briefcase after Roman Reigns defeated Dean Ambrose, and eventually Sheamus pinned Reigns to win the title! * * * NOTES: Triple H won the 30-man Royal Rumble match to win the WWE championship. * * * NOTES: Seth Rollins defeated WWE world heavyweight champion Roman Reigns to win the title. After the match, Dean Ambrose cashed in his “Money in the Bank” briefcase and pinned Seth Rollins to win the title. * * * NOTES: Bray Wyatt defeated AJ Styles, Baron Corbin, Dean Ambrose, champion John Cena, and The Miz in a Elimination Chamber match to win the WWE title.